Brown Cowboy Hat glitch… | Roblox Direct!! Recently, I went to the ROBLOX Catalog to buy the Brown Cowboy Hat. The new lighting model causes this effect. 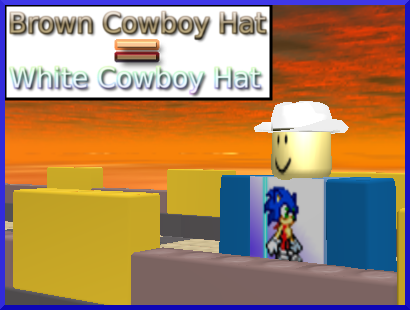 Basically, if this glitch is not going to be fix, then expect to buy a Brown Cowboy Hat instead of a White one. You’ll actually get a white one for cheaper! 😛 Keep in note that this only works if you go in-game. On the site, you will still see a brown one.